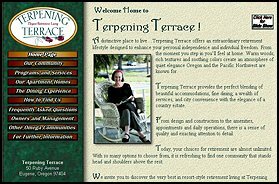 Terpening Terrace is an active retirement community in Eugene Oregon. The Terpening Terrace web site features slideshows, cgi information request form, and image rollover navigation. Images for the site were produced from both scanned conventional photography and still images extracted from digital video. 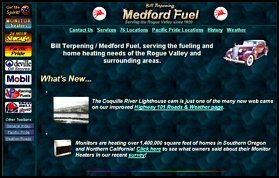 Because the owners of the facility allowed Cascade Web Works to design the basic infrastructure of the website prior to creation of the visible page content, we were able to optimize this site to achieve and retain numerous top five rankings on pre-selected, relevant search phrases on the top search engines. 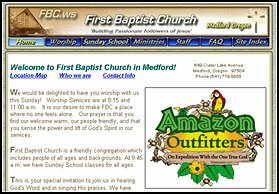 The website for First Baptist Church in Medford, Oregon was one of our original projects to include working E-mail links designed to prevent collection of E-mail addresses (and large amounts of junk E-mail) by automatic "E-mail harvesting" programs crawling the Internet. Once an address is collected from a "mailto:" link on a website by one of these programs, it is only a matter of months until the address is included in bulk E-mail lists for sale to mass marketers, and the addressee begins receiving copius amounts of SPAM (unsolicited and often offensive bulk E-mail). Once this occurs, the only way to correct the problem is to cancel that particular E-mail account. For this reason, it is becoming increasingly critical in website design to include measures to prevent this from occurring. 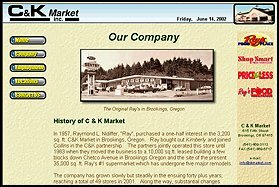 C & K Market, Inc. headquartered in Brookings, Oregon is one of the top 25 privately-owned companies in the state. 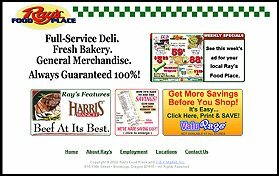 C & K Market owns more than 45 grocery stores with several thousand employees in Oregon and Northern California.